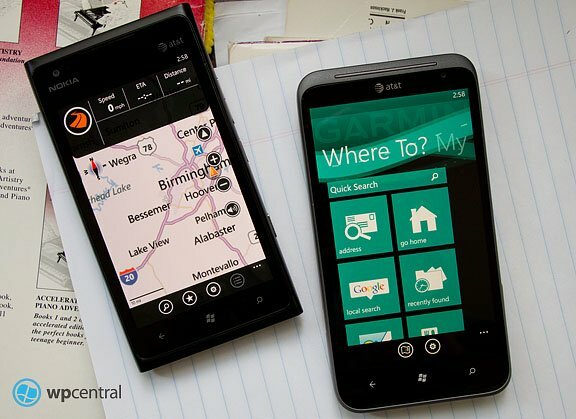 One of the many ways your Windows Phone can be useful is to help us find our way. Whether it's finding the local pizza joint or finding you way to your vacation spot, there are plenty of navigational apps available at the Windows Phone Store. These apps are more than capable of being your co-pilot as you make your rounds on the highways and motorways. Nokia Lumia Windows Phone owners have the benefit of Nokia Maps and Nokia Drive to help get them around but what about apps for other Windows Phones? 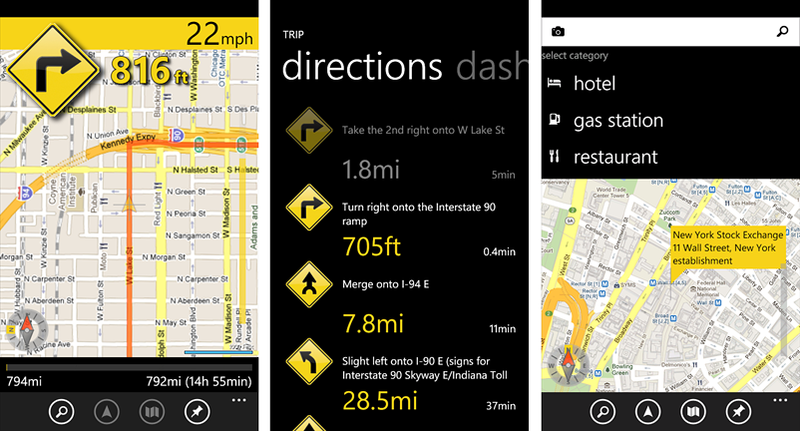 We have pulled the top five paid navigation apps from the Windows Phone Store for this week's roundup. Each of these apps have trial versions that will let you try things out before buying and they cover a wide range of pricing. Should you're favorite navigation app fall outside the top five, feel free to share your choice in the comments below. gMaps Pro ($1.99): gMaps Pro is a Windows Phone client for Google Maps (no official affiliation). gMaps Pro's features include keyword searches, a discover option to find local businesses, a healthy amount of map layers, as well as turn by turn directions. gMaps Pro is really well laid out with the map being the centerpiece. Layer controls rest on the right upper corner and include compass, traffic, mass transit, bicycle routes, weather, a Google Latitude layer. The weather layer simply adds a weather symbols to the screen with an current conditions icon and temp. It will also add cloud cover and radar imagery to the mix. Add Street View, contact integration (pull up a contact and generate directions to their address), and the ability to share maps and routes into the mix and gMaps Pro isn't looking too shabby. The Achilles Heel with gMaps Pro, as with other apps in the roundup, is that you are dependent on a data connection for your maps. If you frequently travel in areas with weak signals, you may want to look at some of the alternatives with on-board mapping. There is a free, ad supported version of gMaps Pro (simply titled gMaps) and there is a trial version of gMaps Pro to let you try things out before buying. The full version of gMaps Pro is currently running $1.99 and you can find it here at the Windows Phone Store. Garmin StreetPilot ($29.99): Garmin isn't new to the navigation business with their stand alone GPS units. 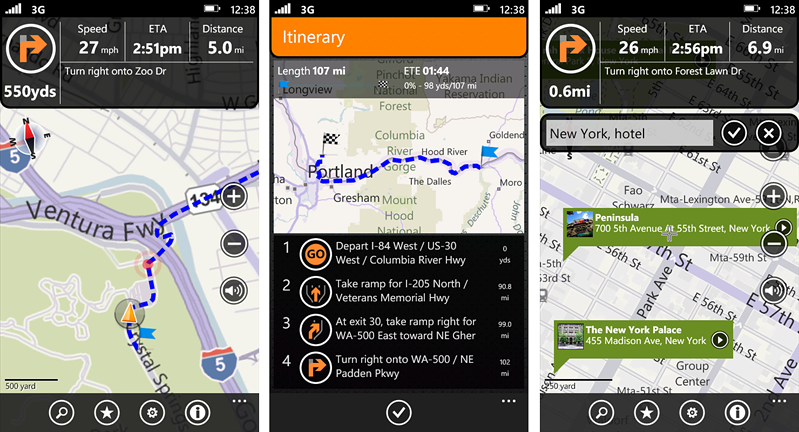 Garmin StreetPilot brings their navigation software to your Windows Phone. The layout of Garmin StreetPilot presents you with a series of main pages that is highlighted with the Where To? page that is a series of tiles to get you where you need to go. The Where To? page has options to look up an address, go to your home address, conduct a Google search, view your recently found addresses, check in through FourSquare, find local businesses, view your favorites, pull up contact locations, access a trip planner, check on flight status, search for a city map and search for a specific intersection. Tons of options. Two additional main pages exist that covers My Locations (favorites) and Traffic. Settings and access to the map itself are accessed through two button controls that line the bottom of the main pages. The map view is very similar to what you would see on a Garmin Nuvi dashboard GPS unit. Location information (pulled up by searches or tapping on the screen) will detail the address, longitude/latitude, any business information (contact number, email, website, etc.) and the current weather conditions with extended forecast. Oh... and you also get turn by turn directions with voice navigation. Once you plan a route, an additional page will be generated on the main pages to cover your directions. Also, as you use StreetPilot a Suggestions page will be generated to list places nearby that you might be interested in visiting. The list is generated based on your use of StreetPilot. The only thing missing with StreetPilot is onboard maps. Add that feature and Garmin StreetPilot may very well be the best navigation app for your Windows Phone. Still, as is, Garmin StreetPilot is a feature rich, capable navigation app for your Windows Phone that's hard to beat. There is a trial version to let you try things out but is restricted to basic navigation and does not have voice navigation. 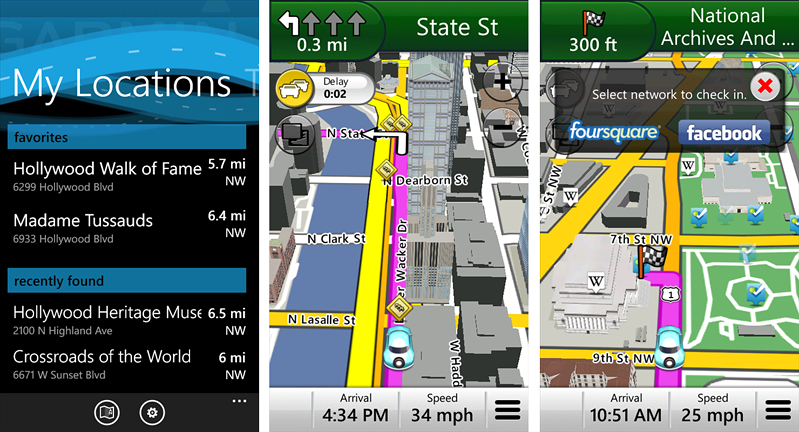 The full version of Garmin StreetPilot is currently running $29.99 and you can find it here at the Windows Phone Store. Turn by Turn Navigation ($4.99): Turn by Turn Navigation may not have as many bells and whistles as Garmin's StreetPilot, it does a decent job of things. Navigation centers things around the map view with a point of interest/keyword search feature to help find your destination. Navigation will also tap into your Windows Phone contacts to guide you their addresses as well. Search results (or just tapping on the map) will generate a location flag that will highlight the address. Tap on the flag and you'll pull up additional information including business information (website, phone number, etc) and a "GO" button to generate a route to that point. You can also tag an address as a favorite for future reference. Driving directions are not only offered in turn by turn style but also with voice commands. Navigation does rely on online maps but you can save a portion of the map on your Windows Phone to reduce the dependency on online maps. Data is only needed for routing when using the saved maps. You just need to be careful and not stray from the saved area. Turn by Turn Navigation does have a trial version to let you try things out before buying. The full version will run you $4.99 and you can grab it here at the Windows Phone Store. Note: GPS Tuner, Navigation's developer, does offer a version with offline/onboard maps for a wide assortment of Countries. Pricing ranges from $33.99 and up. Turn by Turn USA+Canada is in the top ten for paid navigation apps for your Windows Phone. Also, GPS Tuner offers Outdoor Navigation that is a mapping app oriented towards hiking and a very nice app in its own right. Outdoor Navigation sits at number four on the top paid navigation app's list. However, seeing that the roundup is dealing with roadway navigation apps, Outdoor Navigation wasn't included but deserved a mention. GPS Voice Navigation ($6.99): GPS Voice Navigation falls in line with Turn by Turn Navigation by being a scaled back but very handy navigation app for our Windows Phone. I'd be tempted to describe these styled navigation apps as basic but they are very capable in their own right. GPS Voice Navigation gives you the choice of four online map providers, Google, Bing, MapQuest and Nokia. Keyword searches can be done by street address, place or hotel. As with other navigation apps, when you pull up information on a specific business GPS Voice Navigation will display the address, any website links, phone numbers and the ability to generate directions to the address. You can also book reservations to many of the hotels and restaurants via booking.com. GPS Voice Navigation has an odd way to tap and identify a point on the map that some may not find too appealing. You line the cross-hair up on the map point you want to discover and tap the Lookup button located at the bottom of the screen. A flag will pop up on the map with the points address and in tapping on the flag, you can pull up more detailed information. While GPS Voice Navigation has spoken driving instructions (app title should give that feature away), it lacks integration with your Windows Phone contacts. Which may or may not be a big deal. The other weakness is the use of online maps which makes GPS Voice Navigation data dependent. There is a trial version available for GPS Voice Navigation to let you try things out. The full version will run you $6.99. 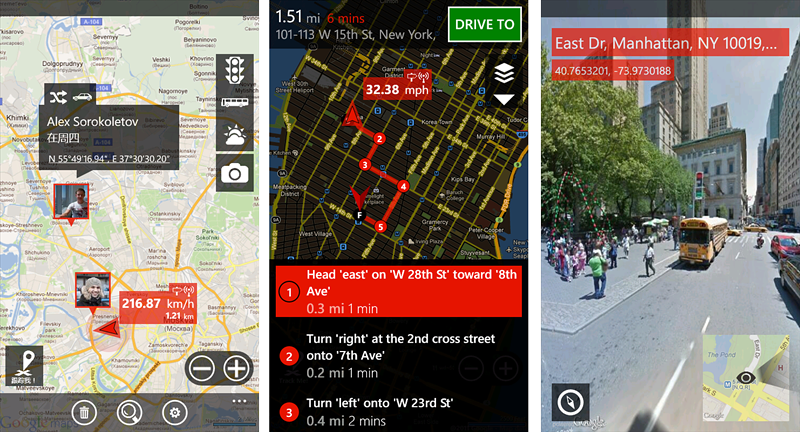 You can find GPS Voice Navigation here at the Windows Phone Store. Radar ($1.99): Radar may sound like the odd man out in this week's roundup. It is a navigation app to help get you back to a starting point (e.g. where you parked your car) and is within the top five apps (discounting Outdoor Navigation). So we figured why not. Radar is a track-back app for your Windows Phone that uses your location services to mark a point and guide you back when the time is ready. For example, holiday shopping is right around the corner and mall parking lots will be more congested. With Radar you can mark where you parked your car and use the app to guide you back after a long day of shopping. Radar is laid out simple with Radar and Target pages. You have five targets with icons (Custom, Car, Hotel, Bicycle, and Camp) that will appear on the Radar Page when set. You can also take a picture of the location to help identify things a little better and eliminates the need for a description. There is a free trial version for Radar that is limited in the number of targets you want to track. 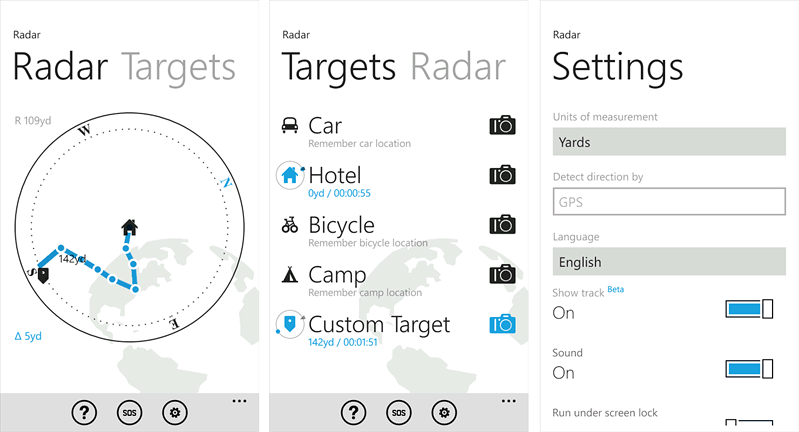 The full version is currently running $1.99 and you can find Radar here at the Windows Phone Store. We would be remised if we didn't extend an honorable mention to one navigation app that is available in the Windows Phone Store, NAVIGON. It's not in the top five but does sit nicely within the top fifty paid navigation apps. What sets NAVIGON apart from most navigation apps is the use of offline maps. NAVIGON will rival Garmin StreetPilot for features but has the advantage of not depending on data to get you around. This may not be an important feature to some, but I travel areas where a data connection is non-existent so offline maps can really come in handy. NAVIGON is the more pricey of the navigation apps and that might be what's holding it back in the rankings. NAVIGON USA is running $49.99 and has maps for all fifty States available for download. NAVIGON Europe is running $99.99 and has maps for forty European Countries. So there you have it. 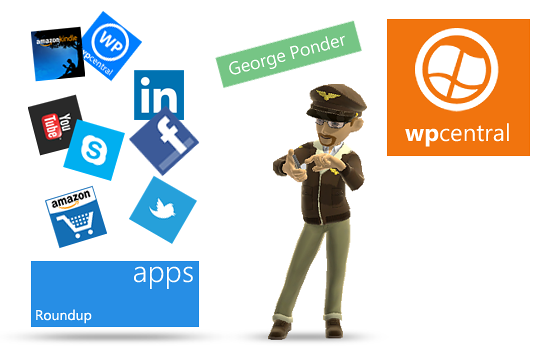 The top five (plus a few more thrown in for good measure) paid navigation apps from the Windows Phone Store. If you have a favorite navigation app that falls outside the roundup, feel free to share in the comments below.